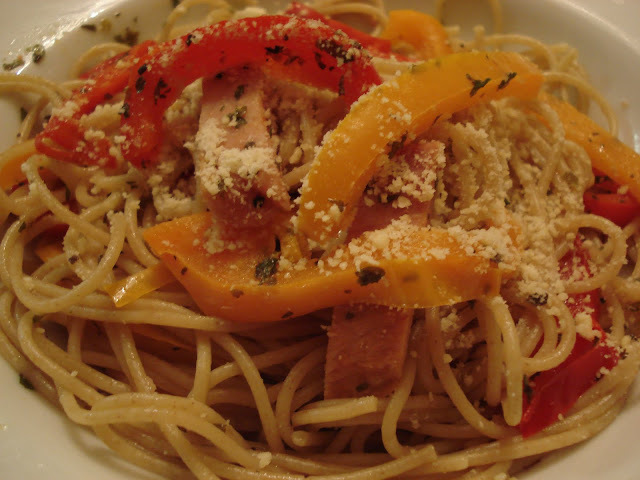 This can be made with left over ham, or low fat deli ham, cut into strips sauteed together in a light broth and poured over whole wheat Spaghetti, makes a nice light sauce. This meal is done as quickly as it takes to cook the Spaghetti, faster than ordering take out and more economical healthier too! This makes enough sauce for a 375 gm package of regular or Whole Wheat Spaghetti. Saute julienne (thinly sliced into strips) peppers for a few minutes to soften them. Add the ham (also sliced into thin strips) and the remaining ingredients. 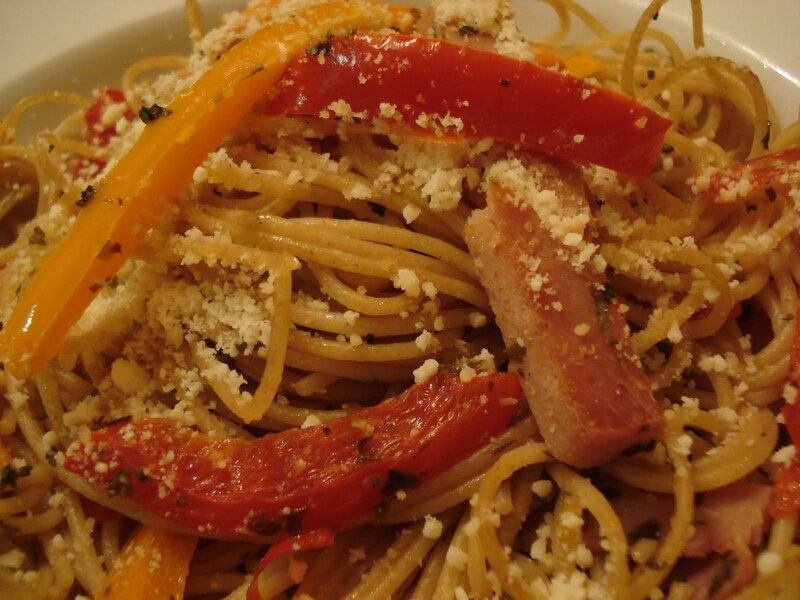 *Pour sauce over Spaghetti and serve with freshly grated Parmesan Cheese, if desired*. This is also a very economical meal to make for a crowd at a Potluck dinner. Very easily doubled or tripled. It's nice to have another spaghetti idea. Sounds and looks tasty Char. definitely going to add this one, it looks super yum! Made this for supper tonight. Yum! And thanks for yet another great idea. Being a pork producer, I love to find more ways to serve ham, especially leftovers. This one is a keeper! Looks wonderful, I like easy dishes. I've just made this for dinner and it was very tasty. I shall be making it again. I had my friends over for lunch and one of them has to eat a gluten free diet. I made this and served it with rice noodles, and the ladies all wanted the recipe. Thank you for being such a good resource and inspiration to us newbies. Faster, more economical and healthier. I'm with you there. Thanks.